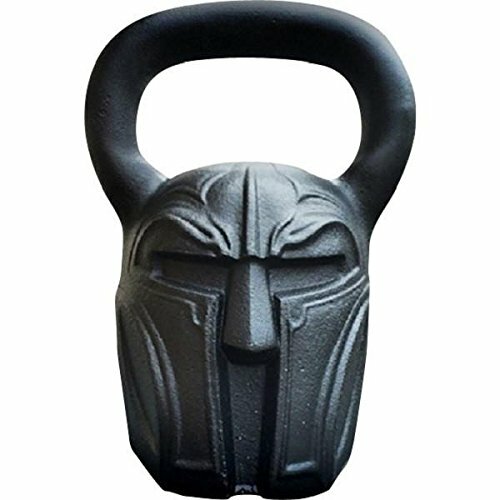 -> Spartan Kettlebell is perfect tool for building strength and toning your entire body. This 54 lbs Spartan Exercise Kettlebell is well-balanced with ergonomic surfaces to support your forearm during overhead movements. -> Kettlebell weights are effective for total crossfit workout, HIIT, develop forearms, build strength, muscle toning and active recovery. It works great to build up and increase your strength, stability and power. ->The compact size and extra-large handle make it easy to grip with one or both hands, and easy for both men and women to use. Designed for a safe and comfortable workout. -> These kettle weights are great for both beginners and advanced athletes. It can be used to focus individually on muscles to increase size and strength. -> There are many health benefits you can get from exercising with these spartan ketlebells. It is much more comfortable than other kettlebells. -> Choose the different weights (54 lb, 24 kg, 1.5 Pood) that best suit your workout routine and fitness levels. -> Works great for stabilizing your muscles - for active recovery. -> Builds strength, stability and power. -> Improves movement, agility and speed. -> Improves stamina and coordination. Choose the different weights (54 lb, 24 kg, 1.5 Pood) that best suits your workout! If you have any questions about this product by Gorilla Fitness, contact us by completing and submitting the form below. If you are looking for a specif part number, please include it with your message.